Pardon The Punctuation...I'm such a fan of chef Masaharu Morimoto that I went to two of his restaurants...in 6 days...and 3,000 miles apart. Yeah, I'm that guy. On my last night of a trip to NYC I went to Morimoto New York and on my last night in Napa a week later I dined at Morimoto Napa. That's how friggin good his food is. Known for his innovate and creative dishes on "Iron Chef", chef Morimoto brings that same innovation and creativity to these two restaurants. From the decor to the design of the menu, everything at these establishments touches all of the senses. Duh...and of course the food rocks. I'm gonna break down what I had starting with New York. Morimotini: This is the chef's spin on a martini made with vodka, sake, and thin slices of cucumber..don't worry i'm adding the recipe for this at the bottom. These things are pretty addictive..had 2 of them with dinner and I was almost out for the count. Too bad they don't have it on the menu at Morimoto Napa. They tried to make me one but it wasn't the same. I was able to procure a recipe for it and included it below. Crispy Rock Shrimp Tempura: with Kochujan sauce and wasabi aioli. One of the best hot appetizers on the menu. A nice mix of sweet and and spicy and perfectly battered. They are win win. Braised Black Cod: with ginger-soy reduction. A perfectly cooked piece of fish full of flavor. Flaky, with a gorgeous hint of ginger. Every bite gets better and better. Now lets talk about Morimoto Napa. 45 Day Aged Snake River Farms "Gold Label" Filet: with sweet onion and garlic jus. Holy mother....this is one of the most amazing steaks I've ever had. Served on a hot skillet with the jus poured over creating a steaming delicious aroma that can be smelled tables away. This is the kind of food that wars could be fought over. 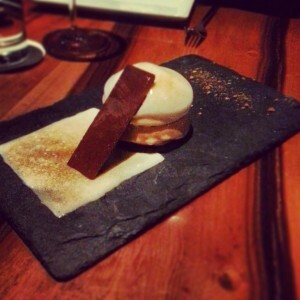 S'more: with kurumitsu graham, smoked soy chocolate mousse, and toasted marshmallow. The layered flavors and the smoked soy chocolate mousse is so addictive it could probably bring Whitney Houston back from the dead. Doughnuts: with asian inspired sugars, honey, and molasses. Lightly fried and the variety of dips make this feel like several desserts in one. It's good to know that no matter what side of the country you're on, there's a Morimoto close by. Also there are several items on the menus that won't break the bank and I strongly encourage you to sit at the sushi bar at the Chelsea location. Fun chef watching. Morimoto has earned my time and money whenever I'm in a town with one of his establishments. He's one of the best and his restaurants are a reflection of that. Go check any of his restaurants out...like now.